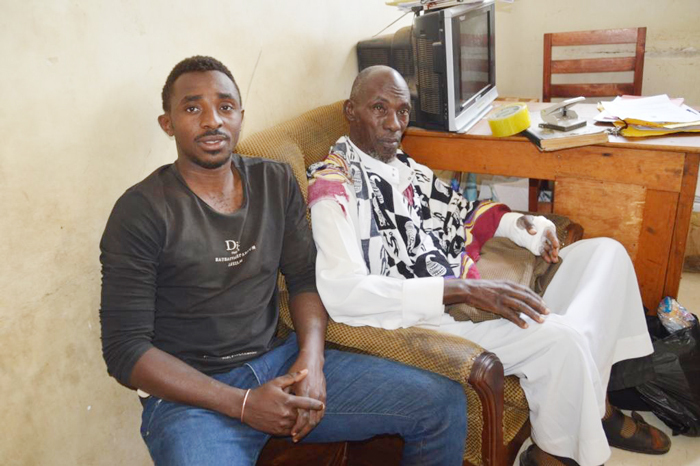 MBARARA – Idrisa Kaweesa and one of his sons identified as Salim Tugume were arrested on Friday and are currently held at Mbarara Central Police Station following the violent fight on New Year’s Eve. Kaweesa and a group of his sons on December 31 attacked his son and self-proclaimed king Umar Asiimwe before dislodging him from Itaaba land, which they both claim is the seat of the defunct kingdom. Samson Kasasira, the Police spokesperson for Rwizi region, said Kaweesa was arrested after he refused to produce some of his children who were engaged in the 31st December brawl where Asimwe lost an eye. Kasasira said the family is now involved in serious fights over the ownership of Itaaba land where Umar and his father Kaweesa are claiming ownership. He added that the arrest aimed at extracting statements from him pertaining the ongoing fracas over the ownership. “The reason as to why the Police went and picked him is because he has been on Police bond and had not been coming to report. Secondly, the Police asked him to produce all those who were engaged in the fight and he refused to comply. Therefore, he and one of his sons are here. They are going to record statements and when they get sureties, they will be released on bond,” said Kasasira. After the fight, Kaweesa banished his son Asimwe from accessing the land, saying he had disowned him. He also enthroned himself as the king to take over and run the activities of the kingdom. Polly Muyambi, the spokesperson of the Asiimwe side said the land belongs to Ankole Karo Kalungi, an institution that was registered by Umar Asimwe when he enthroned himself. “This Itaaba land was where they used to crown all the Kings of Ankore. So, the land belongs to the kingdom. Initially, it was small, but Umar kept on buying land from the neighbours and expanded,” he said. However, on the agreement seen by this website shows that the ownership of the land was recorded in the names of Ankole Karo Kalungi and it was signed by Kaweesa and bears the stamps of the LC1 chairman. It showed that Kaweesa bought the land at sh3m. Kaweesa had prior confirmed to us that he bought the land himself when he sold off his Fuso truck.